Bellona.org > Latest News > Nuclear issues > Nuclear Meltdown in Japan > Concerns mount over the growing threat from Fukushima’s spent fuel – will the experts’ warning call be heard? MOSCOW – More than a year since the catastrophic nuclear and radiation disaster at Japan’s Fukushima Nuclear Power Plant, concerns loom ever larger over the site as experts warn with increasing worry of the unstable condition of the cooling pond at Unit 4, where spent nuclear fuel holds ten times the amount of radioactive cesium that was blown into the atmosphere with the 1986 reactor explosion at Chernobyl. Russia would be well served to join their call for action – will it? Stabilizing the vast stockpile of spent nuclear fuel that remains at the site is an issue of critical urgency, says a joint petition that nuclear experts, politicians, and environmentalists from 72 Japanese ecological groups addressed on May 1 to UN Secretary General Ban Ki-moon, requesting that the UN lend its weight in organizing and coordinating an immediate international response to address the risk. This, furthermore, is a risk that neither globally renowned experts nor the media have let pass unnoticed, the petitioners point out. Apparently, however, they feel Japan’s own efforts in tackling the crisis – which is still very much in progress at Fukushima, where spent fuel is concerned – are an inadequate match to the seriousness of the problem and, thus, they clamor for international assistance. Indeed, the Japanese public has entertained less trust in the government since the disaster at Fukushima revealed just how cozy a relationship the country’s nuclear industry had enjoyed with its supervisory authorities prior to the catastrophe and how firm a handle it managed to hold on any information about the accident as it was unfolding. The cooling pond of Reactor Unit 4 warrants special and urgent attention, the petition says. Should another earthquake or some other adverse event cause the pond to drain, exposing the spent nuclear rods in storage, an ensuing fire may lead to new radioactive discharges – a menace of staggering proportions, given the amounts of radioactive substances still concentrated in the pond. More than a year on, works are still under way to clean up and secure the plant after a powerful earthquake shook Fukushima in March 2011 and a devastating tsunami wave that came in its wake knocked out its cooling systems. In a matter of days, the natural calamity evolved into a nuclear catastrophe Japan is still grappling to overcome, with hydrogen explosions, multiple core meltdowns, massive releases of radiation, and forced evacuation of hundreds of thousands of residents. Late last year, officials in Japan announced technicians had been able to achieve cold shutdown for all three reactors that had been in distress. 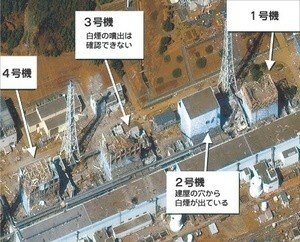 But the onsite storage ponds are yet to be safeguarded – meaning, the crisis is still far from being over at Fukushima. The onsite storage pools, which hold the plant’s spent fuel from all six reactors, posed an equally great – in fact, even greater – threat even as the catastrophe raged on and engineers struggled to provide cooling water to the melting reactors. The storage pool over Reactor Unit 4, which suffered two fires in the first week since the onset of the disaster, had experts worldwide especially worried. With the cooling systems no longer running to pump water into the pools and decay heat from the spent fuel heating up what water remained there, water levels were fast receding, laying bare the fuel rods. Reports at the time said the exact levels of water remained unknown due to spiking levels of radiation that barred precise measurements. Further exposure and contact with air spelled the risk of more water boiling out – and a threat of repeated hydrogen explosions of the kind that had already destroyed the reactor buildings, not to mention damage to the fuel rods’ claddings and unprecedented releases of radiation as a result. This, experts warn, is a scenario that – unless measures are taken immediately to safeguard the spent nuclear fuel at Fukushima – may not just strike again, but dwarf the disaster that erupted at the site last year. One of the authoritative voices behind the petition, Robert Alvarez, who is a leading American nuclear safety expert and a former senior policy adviser to the US Energy Department’s secretary, believes the nuclear waste in the cooling pond at Unit 4 contains ten times the amount of radioactive cesium that was blown into the atmosphere when Reactor 4 exploded at Ukraine’s Chernobyl in 1986 – making an accident involving this spent fuel pool potentially nearly ten times as devastating as the Chernobyl disaster. Altogether, “nearly all of the 10,893 spent fuel assemblies at the Fukushima Daiichi plant sit in pools vulnerable to future earthquakes, with roughly 85 times more long-lived radioactivity than released at Chernobyl,” the petition says. This threat has already compelled politicians to join nuclear experts in their call for action. According to the petitioners, US Senator Roy Wyden, after his visit to Fukushima on April 6, 2012, issued a press release on April 16, pointing out the catastrophic risk posed by Unit 4 and urging the US government to step in with intervention measures. “Senator Wyden also sent a letter to Ichiro Fujisaki, Japan’s Ambassador to the United States, requesting Japan to accept international assistance to tackle the crisis,” the petition says. Faced with yet another impending doom, the Japanese government seems to be doing exactly what it was at the height of the disaster in 2011 – namely, denying the problem and downplaying the risks. Or else why would the Japanese public and experts and politicians alike fear that summoning international intervention was the only recourse left to avert the brewing disaster? The petitioners appeal “to the United Nations to help Japan and the planet” with an urgent request to organize a Nuclear Security Summit and establish an independent assessment team on Fukushima’s Unit 4 that would pool together international expertise in order to bring the spent nuclear fuel crisis under control. No information has yet come in of any reaction to this request. Meanwhile, there is an aspect to these developments that drives it a little closer to home. One implication that bears direct significance for Russia is the geography, plain and simple. If the problem that experts deem too serious to leave to Japan’s handling without international help does escalate into a major catastrophe, this would mean new risks and new headaches for that country’s immediate neighbors – among which Russia is one. And while the UN considers this appeal, Russia, too, would do well to heed the warning voices and join the request for international action. At issue is not only the risk of radioactive fallout that could affect Russia’s Far East – just the mere threat of contamination last year plunged the residents of Russia’s Far Eastern regions into a panic, with many rushing to local pharmacies to stock on iodine – but more radioactively contaminated export goods finding their way across the border. It was only roughly a month ago that Russian customs officials in the Far East reported of yet another (in Russian) batch of Japanese-made cars that had failed to pass radiation safety control upon delivery to a Russian port. And latest tests have revealed radioactive contamination still present in goods and produce in nine prefectures in Japan. Alas, the Russian government’s reaction when the catastrophe at Fukushima Daiichi struck last year was much in the same vein as how Japan’s nuclear officials chose to treat it: Denial, withholding, and understatement. As the disaster at Fukushima kept deteriorating, the Russian nuclear industry, which has never had occasion to complain about a lack of unquestioning support from the Kremlin, responded with upbeat no-need-to-worry commentary multiplied across national TV channels and publications. This is the old “nuclear power is safe” rhetoric it has dedicated too much energy and too many resources disseminating and one it still needs to stay true to – lest it is forced to concede that nuclear energy comes with demons even a nation as technologically advanced as Japan may fail to bring to heel. Just as Japan before Fukushima, Russia has the nuclear industry and government leadership joined at the hip, with the result that it may sooner try to disregard a threat than join a call to address it. But this is an arrangement that not only prevents acknowledgment of a problem that too much effort has been expended denying, but builds a wall of stubborn isolation exactly when so much depends on openness and willingness to offer or accept help. Tragically, Japan is learning the truth of it the hard way. Vladimir Slivyak, frequent contributor to Bellona, is co-chairman of Ecodefense! and author of the recently published “From Hiroshima to Fukushima,” an account of the nuclear industry’s most recent history, combining a detailed chronicle of the 2011 disaster at Fukushima Daiichi Nuclear Power Plant in Japan and an in-depth analysis of the industry’s problems in Russia. Twenty-six years since Chernobyl: Will the nuclear industry outlive its infamy?